← Can I have a second helping of home décor? 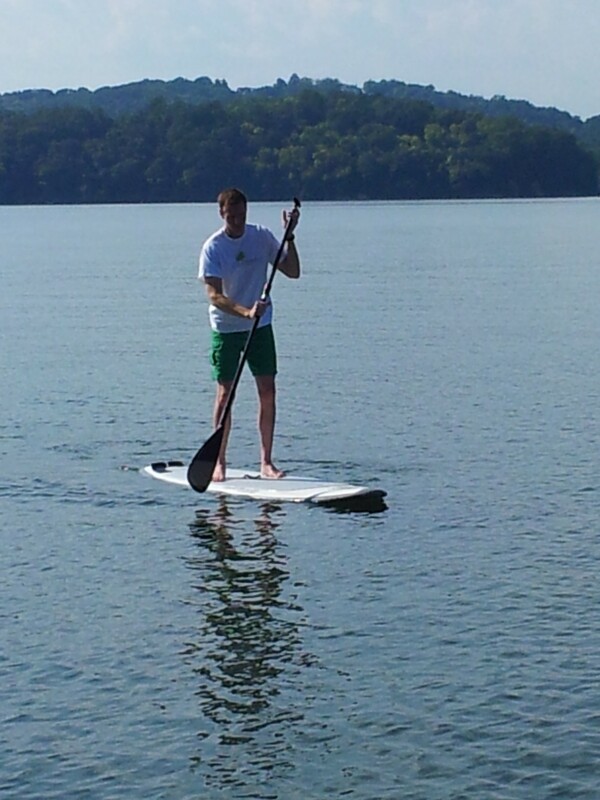 Just like babies have to crawl before they can walk, you have to kneel before you can stand on a SUP. For the last several years during my beach vacation I’ve been seeing people standing on surf boards with big paddles. 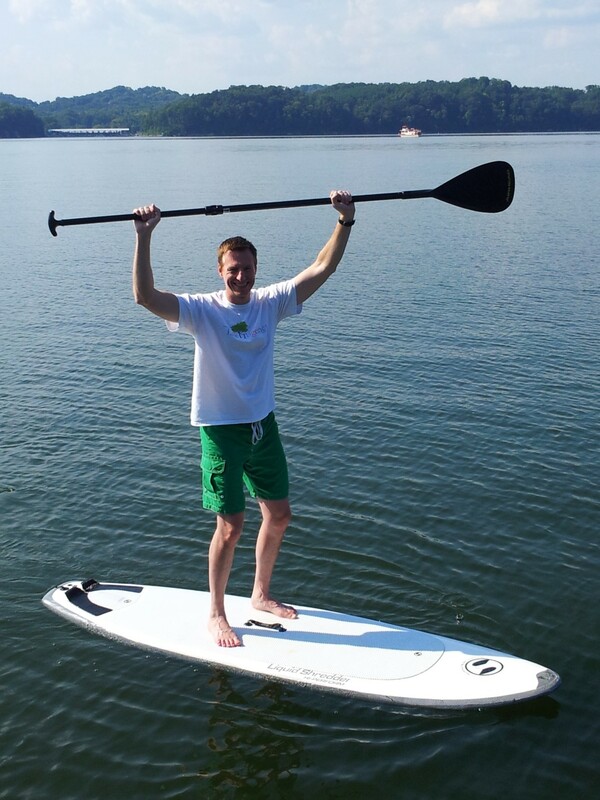 Curious but too timid to tackle this sport on my own, I finally got a taste of stand-up paddle boarding (or SUP as it’s commonly known) this week during a work retreat at Chickamauga Lake in Chattanooga, Tenn.
As I suspected, balance plays a part in your enjoyment of this sport. I was able to get upright my first time, and managed to stay up for about 90 seconds before wiping out and losing my sunglasses – a small price to pay for a new experience and laughter by onlookers. I’ve often been accused of being unbalanced. Here’s photographic evidence. At 6-foot-four, I was also somewhat of sail, being “blown about by the wind and tossed,” to quote Scripture. My colleagues took to it a little bit easier, but I won’t let my physique be an excuse. After a couple of days of SUP, I did a little research and found out stand-up paddle boarding is taking the New South by storm. Like all forms of surfing, the sport has its origins as a form of transportation among the islands of the Pacific. It made a resurgence in Hawaii in the 1960s before surfers exported it to California where it experienced something of a renaissance in the mid-1990s. Now it’s migrating to the East Coast where you can see stand-up paddle boarders in rivers, lakes and the ocean from Florida to Maine. The Yolo board company calls Santa Rosa Beach, Fla., just outside of Destin, its home. That just so happens to be where my family vacations. No wonder we’ve been seeing stand-up paddle boarders! After only one day, I’m a pro. My colleague and talented photo blogger Patricia Heys tried paddle boarding during a recent vacation to Venice Beach, Calif. Patricia has a symbiotic relationship with the sun and enjoys water sports, so naturally she took to the sport with addictive fervor. When she returned to Atlanta, she found a used paddle board online and equipped her family’s lake house with the newfangled watercraft. And the more you fall, the more cardio is involved. It seems every time I took a plunge, I fell backwards, sending the board shooting off 20 or 30 yards away. The paddle doesn’t float, so swimming one-armed to the board was enough to burn a few hundred calories in about 15 minutes. And everything I observed and read is that women are better at it than men. I need more practice to master this sport, but never having surfed, I think this is a realistic alternative for me. And it doesn’t require waves or even saltwater. 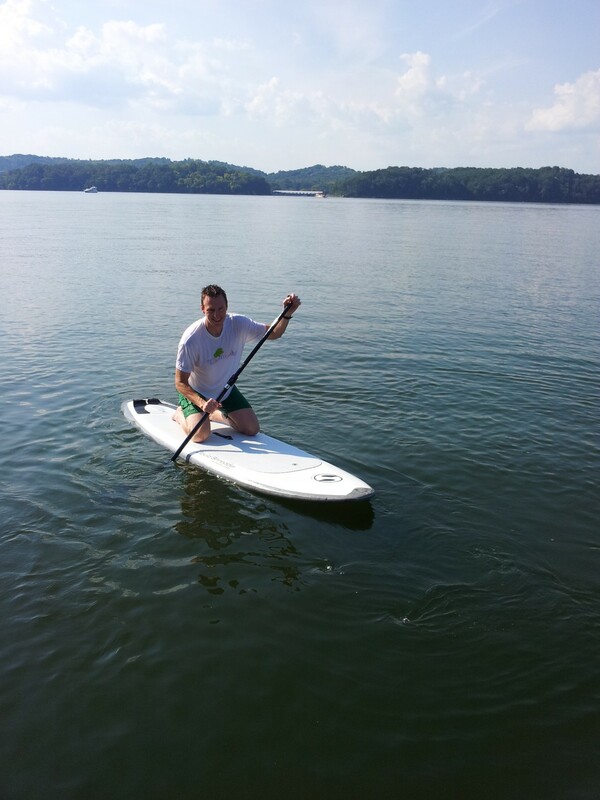 Perfect for the backyard pond or lake, I can see stand-up paddle boarding taking hold in the New South in a big way. There are only a few more weeks of summer, so if you’re going to try it, better hurry. 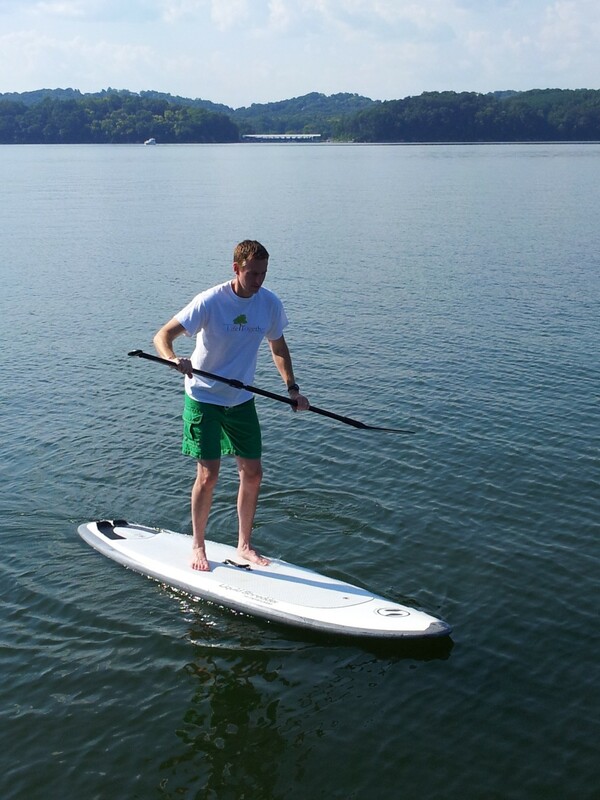 Have you tried stand-up paddle boarding? What was your experience? Leave a comment below and share your story. This entry was posted in Uncategorized and tagged Chattanooga, contemporary South, Destin, Florida, Hawaii, Lake Chickamauga, Lance Elliott Wallace, Lance Wallace, New South, New South Essays, NewSouth, paddle board, paddle boarding, Santa Rosa Beach, South, Southern Culture, Southern Living, Southern sports, Southerners, stand up, stand-up paddle boarding, SUP, surf board, surfing, Tennessee, the South, travel, vacation, Venice Beach, Yolo. Bookmark the permalink. 1 Response to What’s up with SUP?